Good morning! I still had my Making Memories Sabrina goodies out from making my easel card calendar yesterday, so I decided to make a card with some of the scraps. I used Taylored Expressions Sketch #96 for my layout. When choosing my image, I decided to use one of the cuties from the Pure Innocence line by My Favorite Things. This one is called Flower Girl... is she not just the cutest? Of course, I colored her with brown hair since she reminds me of my Sabrina. I know I went a little layer crazy with my card, but I just couldn't stop myself! My blush background is embossed with tiny hearts. The button brads and rub-on sentiment are part of the coordinating line of products. Accessories: Rectangle and Circle Nestabilities (Spellbinders), Love Language embossing folder (Provo Craft), Eyelet Lace border punch (Martha Stewart), Markers (Copic), Button brads and rub-on sentiment (Making Memories), Foam tape, Thread, Sewing machine. This is SO cute, Steph!! I love the DP!! Great job with Taylor's sketch! This is just adorable. I love the background too. Oh this is just the sweetest!! Love it! Holy guacamole! This is AWESOME Stephanie!!! LOVE this Pure Innocence girl and your coloring is GORGTEOUS! FAB papers and rub on too!!! I just added you to my Google reader! LOVE your creations!! Another Beautiful creation! Love the sweet & adorable image, the lace punch makes it looks so delicate. This is darling!! 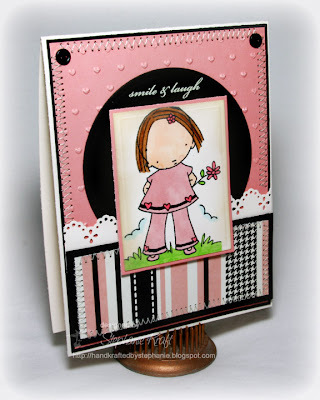 I love the colors, and the heart embossing is a perfect touch! Great job with TESC96! This is so adorable!! Love it! Thanks for playing the sketch challenge! So cute and sweet! Great job on the sketch!